This Polish cream cake dessert was renamed papal cream cake or kremówka papieska (kreh-MOOF-kah pah-PYESS-kah) when it was learned St. Pope John Paul II loved it. Karol Hagenhuber attended Marcin Wadowita high school in Wadowice, Poland (Wadowice is in southern Poland, about 50 kilometers from Krakow), with none other than Karol Wojtyła, who later became the cardinal of Kraków, then Pope John Paul II, and now St. Pope John Paul II. As school chums, they would often stop at Hagenhuber's father's bakery where the future pope would invariably purchase one or two cream cakes and a love affair with the dessert began. 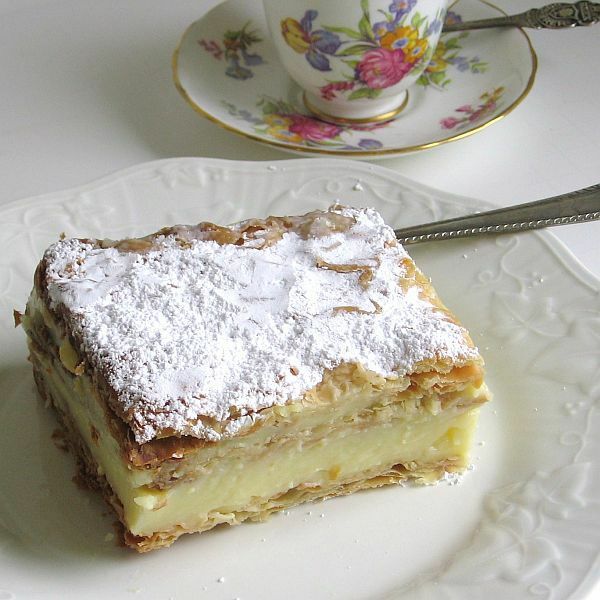 If push came to shove, you could say that kremówka is similar to a French napoleon only in the latter case, the dessert is cut into rectangles, not squares. A very similar Polish dessert is karpatka or Polish Carpathian Mountain cream cake whose uneven top layer dusted with powdered sugar looks like the rugged mountainous terrain of the Polish Highlands. Two Eastern European desserts similar to kremówka are Serbian krempita and sampita which, in the latter case, is filled with meringue. Use the leftover egg whites in another recipe like a meringue torte. Note: while there are multiple steps to this recipe, this cake recipe is broken down into workable categories to help you better plan for preparation and cooking. Roll out each piece of puff pastry slightly to blend the seam lines, keeping it 1/4-inch thick (try not to warp the shape when rolling). Without cutting all the way through, lightly score each pastry sheet into 9 even sections. This is just a guide to be used when cutting and serving. Sandwich each puff pastry sheet between two pieces of parchment paper and two cooling racks. This will keep the pastry flat but still flaky. If you want to bake both pastry sheets at the same time, you will need four cooling racks. Otherwise, bake them separately, using two cooling racks. Bake 15 minutes, remove top rack and top sheet of parchment paper. Replace rack and continue to bake until golden and crispy throughout, about 15 more minutes. Cool completely. While the puff pastry is baking, make the pastry cream. If you like a thick layer of filling, make a double batch. Reduce heat slightly and continue to boil 1 minute, stirring constantly with a wooden spoon to get in the corners. Take the pan off the heat and plunge it into an ice-water bath or, if you have lumps, strain it through a sieve into a pan or heatproof bowl set in ice water. Using a 13-by-9-inch pan as a mold, place one layer of cooked puff pastry in the bottom of the pan. Pour hot pastry cream over it, and place the second layer of cooked puff pastry with the cutting-guide marks on top. Refrigerate until set. When ready to serve, using the prescored marks as guides, cut into 9 pieces. Dust each piece with powdered sugar. Refrigerate the leftovers and enjoy the cake within three to four days.